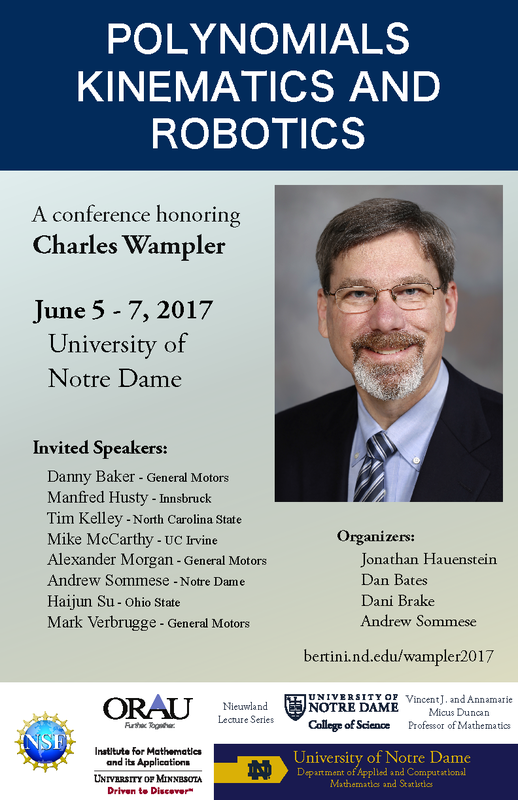 This conference will focus on the interaction between polynomial system solving, kinematics, and robotics. The foundational methods in numerical algebraic geometry were motivated by the solving of polynomial systems arising from kinematics and robotics. For example, versions of homotopy continuation implemented on computers were already being used to solve kinematics problems in the early 1960s. This interplay continues over 50 years later with new algorithms being developed motivated by kinematics and robotics, and novel problems solved using these algorithms. Registration is required in order to attend the conference. We gratefully acknowledge the support of the Nieuwland Lecture Series, Duncan Professor of Mathematics, College of Science, and Department of Applied and Computational Mathematics and Statistics at the University of Notre Dame as well as Oak Ridge Associated Universities, National Science Foundation and the Institute for Mathematics and its Applications.